Victory Slots is one of the sadly forgotten old slots games, from the best creators of online slots games, – RTG. It may be old, but the game is a very fun game to play, with amazing chances to win big. There are 5 reels on the reel machine and 20 paylines. This game is of the most common types of slots games released by RTG. It is a bonus, progressive, video slots, and it has a max jackpot of the generous amount of 10 000 coins, rather than a progressive jackpot. Moreover the second jackpot is of 5000 coins. The theme of the game is history, or to be exact – open seas battles. 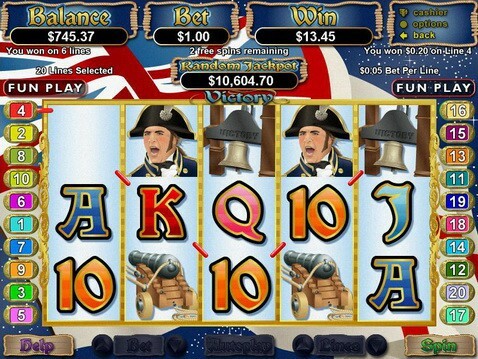 The symbols of the game vary from the normal card values of nine through ace, to ships, a captain, a bell and a gun. The wild symbols in the game are the ships, but there aren’t any multipliers it could gain you. The scatter symbol is a UK flag. There is also an autoplay mode in the game and a bonus game on the reels, which could provide you with up to 50 free spins.